Mary (Ashley Retzlaff) whispers a horrible secret to her grandmother (Mary Buchel) in a scene from Outskirts Theatre’s “The Children’s Hour,” our choice for best drama of 2018. Did you know what a treasure trove of theaters there is in the Milwaukee area? In 2018, I expanded my play-going experiences to include a number of the region’s marvelous little companies. And when it comes to theater, size does not matter. These small groups crank out some amazing performances with their combination of passion and talent. Represented among the more than 50 shows I saw were several companies whose productions I was witnessing for the first time. Voices Found Repertory, Theater Red and Forge Theater all made significant contributions to the 2018 season. I saw three marvelous shows at Voices Found Repertory– “Macbeth,” “Titus Andronicus” and “Medea” – each doing justice to the powerful themes and characters in these classics. Theater Red presented “This Prison in Which I Live,” the second show in its Edwin Booth Series, which featured the actor brother of the famous presidential assassin. 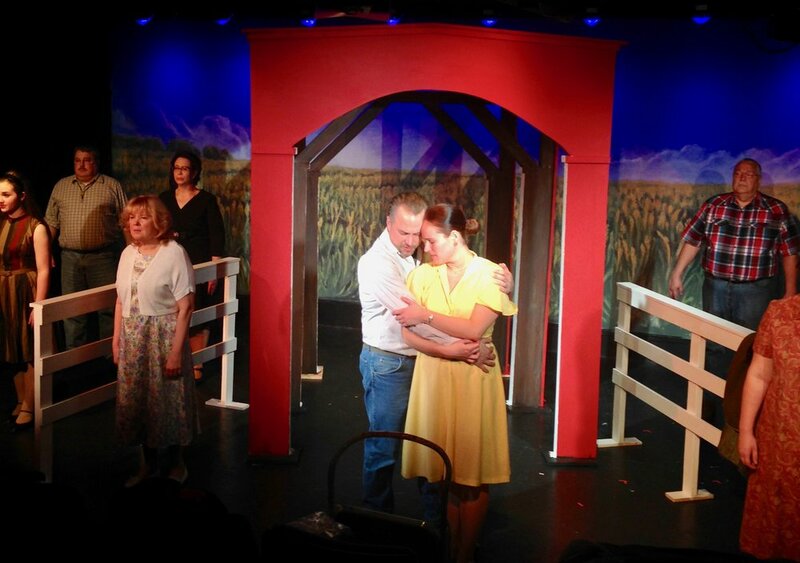 “Becky’s New Car” featured The Forge Theater’s first-rate cast as it traveled through Becky’s infidelity and mid-life crisis. Falls Patio Players presented one of my favorite 2018 shows, “Miss Holmes,” featuring a fantastic Holmes/Watson combo. The group’s “Anything Goes” was a sparkling rendition of the classic musical. An all-kids show lineup filled The Box Theatre’s stage, including a charming “Peter Pan,” while Sudbrink Productions presented a well-tuned kids’ production of “School of Rock.” And speaking of kids, Mukwonago Players used a bunch of students for its production of “Scrooge: The Musical” in the beautiful new auditorium at Mukwonago High School. A 28-piece orchestra showcased the soaring tunes in West Community Theatre’s “The Sound of Music. West Allis Players did well with “Evita” and Tennessee Williams’ “Cat on a Hot Tin Roof.” Boulevard Theatre’s “Mothers and Sons” and Next Act Theatre’s “12 Dates of Christmas” were among the year’s best. There was hardly a bad apple in the bunch, so determining the best was difficult. My best shows had quality performances -- from top to bottom – and were solid vehicles with well-executed staging, which added up to top-notch entertainment. Best performers were engaging and demonstrated an understanding of their character(s) and how they interacted with others, again with the aim to entertain and/or move audiences. “The Children’s Hour” – Outskirts Theatre Co.
Lilian Hellman’s riveting story featured an outstanding cast that mesmerized the audience on opening night. You could barely even hear the audience members breathing, so captivated were they by the performances. The second show in its Edwin Booth Series gave audiences a window into this intriguing character with a smart, well-tuned production. Featuring a cast of 10, this show was captivating. Euripides’ social commentary on a woman’s place in society and the household seems progressive for its time, and appropriate in light of the #MeToo movement. This show was truly magical, dreamlike, ethereal -- perhaps one of the most beautifully presented works I’ve ever seen, mesmerizing and full of surprises, wit and humanity. The cast of Mark Neufang, Nathan Marinan, Joan End and Pamela Stace honored the script with care, respect and intelligence. And the audience left with a better understanding of the LGBTQ community. I found this a totally engaging show from start to finish, thanks mostly to a stellar performance by Kaila Rachel Casalino as Susy. Opening night of SummerStage’s “Tartuffe” revealed a finely-tuned, high-energy, laugh-filled rendition of Moliere’s well-aged comedy. Susie Duecker as Mary, a sometime actress, sometime barista, takes us on a wild roller coaster ride of holiday relationships, starting with Thanksgiving Day. Falls Patio Players’ opening season production features Sherlock Holmes at the center, solving a series of murders. Only this Sherlock is a woman, in a thoroughly smart, sophisticated, witty and absolutely delightful production. The expert Forge cast makes the audience understand the angst of a middle-life crisis while applying a deft and nuanced hand for the comedy, which goes down as easily as a hot toddy on a winter’s day. This comedy had great pacing, due mainly to Hal Erickson’s quick quipping and well-placed inflections that ranged from indignant to sarcastic, from bombastic diatribes to dismissive baby talk. The show constitutes a delightful couple hours at the theater, thanks to Michael Hollinger’s comedy and the cast’s fine work with it. Sunset Playhouse has included all the magic and so much more. The fantasy of Mary Travers’ popular children’s stories from the 1930s is all there. This musical showcases Mel Brooks’ humor in a very slick, sleek, shiny production. It runs fast, on high octane, with first-rate, well-tuned performances, most notably that of Robert A. Zimmerman as Max Bialystock. The show clearly articulates its themes – the solidarity of the miners through hard times, Billy’s father wanting the best for his family and Billy keeping his dream alive despite opposition. The high-energy, whimsical show articulated its classic message of youth seeking to do something great and ending with a bit of “Wizard of Oz” and “There’s no place like home” for Pippin. Falls Patio Players captures all the fun and joy of the show and showcases the wonderful melodies with a top-notch cast, superb orchestra and snappy dancing. Katie Berg’s and Eric Madson’s lonely characters are stretched to peaks of longing, lust and love, carried along gorgeously -- flowing like a river with the help of guitar, bass, violin, cello and piano. Hal Erickson can check this plum role off his list with a highly entertaining portrayal of the cantankerous Sheridan Whiteside. Erickson displayed his comic chops as well in Sunset’s “Any Number Can Die,” as detective Hannibal Hix. Allen channels a bit of Groucho Marx for this thoroughly entertaining characterization of Moonface Martin. Zimmerman’s performance is perfectly pitched as he epitomizes the crusty, scheming Max. He handles the lines with precision, never losing sight of each situation. He moves with purpose and handles several dance scenes and vocals easily. Neufang and Marinan as gay couple Will and Cal were simply superb, trying to control their exasperation at the stereotypes and mean-spirited questions they’ve had to endure through the years. Their arguments resonate with believability. McDaris gives a remarkable performance as Edwin Booth, tortured by his infamous brother and thoughts of his dead wife. His Edwin carries himself like the esteemed performer he is. This show really showcases the considerable talents of Berg as Francesca. From the opening we can feel her longing as she stands alone onstage. Berg’s lovely, classic soprano voice easily handles the lilting melodies. Lipor is lovely and trim as Poppins, wearing Lisa Quinn’s stunning outfits in blue and red, straight and tall like a stern schoolmarm. Her character carries off all the whimsy and magic like it’s nothing at all and with a soprano voice that soars effortlessly, as well as graceful movements and demeanor. Johnston is mesmerizing as the cool-headed titular heroine who concocts clever strategies and uses her feminine wiles to exact revenge on her unfaithful husband, Jason (of Jason and the Argonauts). Nappe and McKinney are an absolutely delightful Holmes-Watson duo. Nappe has so much fun with Holmes, ramrodding her way through danger with total delight. As Watson, McKinney is a wonderful complement – perfectly delivering her amazement at Holmes’ intelligence, her trepidation at Holmes’ recklessness and her attempts to reign in the super sleuth’s free spirit. Hansmann takes the lead with a whole toolbox of acting skills as she rambles through Becky’s life, which seems to be stuck in neutral. She captures Becky’s frustration with body language and a whole host of expressions. Duecker’s Mary is so relatable – she’s like your sister, your daughter, your friend. She could be someone you know. She takes Ginna Hoben’s lines and makes them her own. Kaila Rachel Casalino plays a blind woman in Waukesha Civic Theatre’s thriller “Wait Until Dark.